Learn the details in measuring, mixing, fermenting, shaping, slashing, steaming, and baking techniques in this Basic Bread Class open to both novice and experienced bakers. 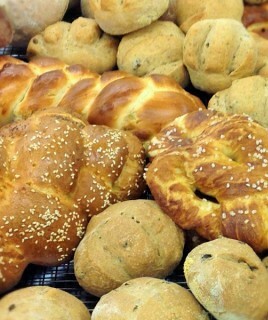 In this hands-on workshop, you will be making Focaccia, braiding Challah Bread, shaping French bread into Baguettes, Dinner Rolls, and Fougasses. There is nothing more delicious than cutting into a warm freshly baked bread from the oven. With the skills you will learn in this class, you will leave with confidence to make any bread recipe and shape any loaf at your own home for you and your family to enjoy. Chinese Cuisine to Celebrate Chinese New Year!